COSMOThe selected variable and region is available, but not for 2019-04-24, 00:00. You will switch back to the first available time step. COSMO is the high resolution regional forecast model of DWD. It covers Central Europe with a resolution of 2.8 km and is run 8 times a day (0,3,6,9,12,15,18,21 UTC). 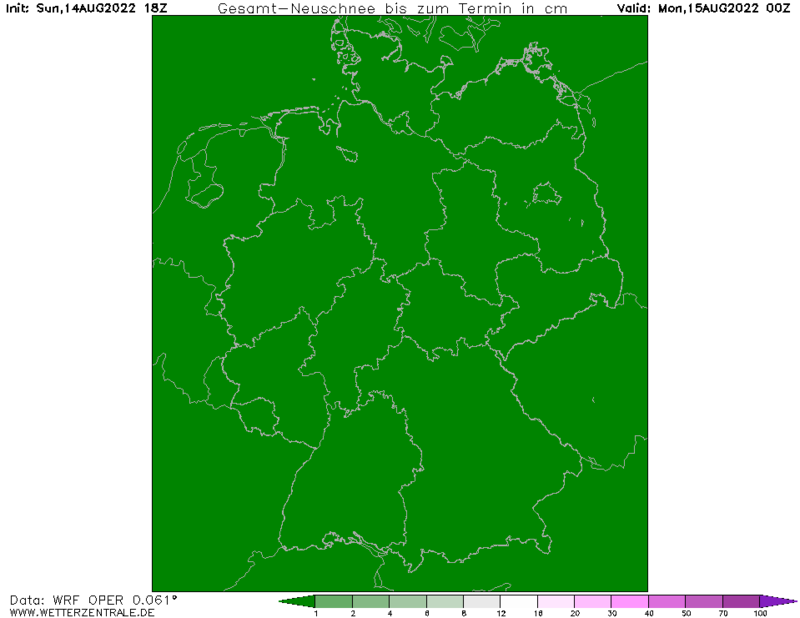 Forecast period is 27 h.
HIRLAMThe selected variable and region is available, but not for 2019-04-24, 00:00. You will switch back to the first available time step. HIRLAM is a regional model used by many weather services. WZ offers the Dutch (KNMI) and Finnish (FMI) version. It covers Europe with 10 km resolution and is calculated 4 times per day with 48 h forecasts. WRFCurrently selected. WRF (Weather Research and Forecasting model) is a freely available weather forecast model. WRF version 3.9 is run on the WZ servers and offers 4 forecasts per day up to 72 hours. It is currently run with a horizontal grid spacing of 5 km and uses the WRF single-moment 3 class microphysics scheme, the YSU PBL scheme and the Dudhia radiation scheme. 500 hPa Geopot. Height 850 hPa Temp. 850 hPa pot. equivalent temp. 700 hPa Rel. humidity 700 hPa Wind 850 hPa Wind 925 hPa Wind 925 hPa Temp.